H&F Council’s Conservative Administration is being exposed in the Rotten Boroughs section of the current (no 1192) issue of Private Eye - available in all good newsagents since 28th August. The story features the 18% pay hike the Conservative councillors voted themselves in February and the new £6k bonus the Tories voted to pay to a leading, fellow Conservative councillor in June. Private Eye tells how the 18% pay rise for Tory councillors was initially pushed through on the same evening that they also voted to remove £34million of "savage" cuts in local services. Question: When would be the worst time of year to close the skate board area in Ravenscourt Park? Answer: The beginning of the summer school holidays. Believe it or not that’s exactly what H&F Council have done. I’ve written to the Administration to find out what lay behind this decision and when it will be reopened. I will report back. The Police and H&F Council have agreed to set up a Youth Commission following lobbying from Cllr. Lisa Nandy (Lab), Cllr. Mike Cartwright (Lab) and myself. We have pushed for a more co-ordinated approach to youth matters between the local agencies as well as more and better youth facilities. This being one strand of the actions we are campaigning for H&F Council to take after the murder of a young man in Hammersmith Grove in the north of our ward last March. Last month the Government promised significant increases in funding and published Aiming High for Young People: A Ten Year Strategy for Positive Activities. It’s a surprisingly interesting read which you can view by clicking here. Young people are actually more likely to be the victims of crime than any other group in society. Research demonstrates that the majority of young people do not become involved in anti-social behaviour and very few indeed become involved in perpetrating crime. However, our young are bombarded with an increasing array of influences offering new challenges for parents, schools, government agencies and young people themselves as they aspire to instill values, boundaries, disciplines and skills that will take them forward in life. The government report seeks to place these challenges into some perspective and chart a way forward. My fellow ward councillors and I are keen that H&F Council responds positively to this report. It makes that point itself saying “Delivering this Strategy, and wider reform of services and support for young people, will depend on the commitment of Local Authorities”. H&F Council must involve local young people as well as local parents in its commission. The H&F Youth Commission should be more than another Council talking-shop, and must be capable of making proposals that command fresh investment. I’ll let you know how this develops. I haven’t been invited. 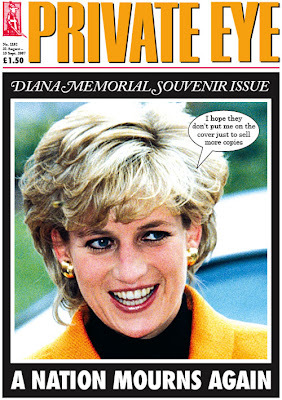 But, at 7.00pm on 26th September, Cllr. Stephen Greenhalgh (Con) plans to deliver his annual “State of the Borough Address” to an invited audience of what he believes will be key opinion formers in Hammersmith and Fulham. Mimicking the US Presidents’ State of the Union Address, but er… not quite on the same scale; Cllr. Greenhalgh will hope to sell his Administration’s deeds to the addressees - all arranged at local tax payers’ expense and in a location that is currently being kept secret. planning to knock down Hammersmith’s cinema to replace it with luxury offices for Town Hall bureaucrats. Actually, I don’t mind Cllr. Greenhalgh selling the Conservatives’ point of view. It’s his democratic right but I strongly object to it being paid for from tax payers’ funds. Why do they need to raid H&F Council's finances to pay for what is an unashamed propaganda exercise? They used to pay for exactly the same event out of Tory party funds before they won power in 2006. Now, they obviously think it’s good value for you, me and everyone else in the borough to fund their event out of our pockets. 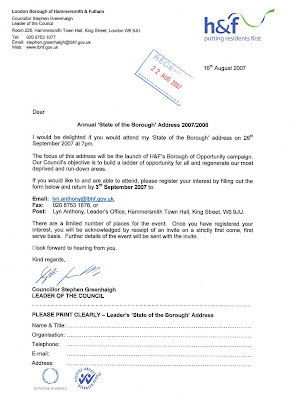 Click on the attached letter (I've removed the name and address of the person it was sent to) to see the invite in full. Is That John Redwood On My Telly? I thought my eyes were deceiving me. I had them checked a while back and they were fine but when peering at the TV news channels all last week I kept seeing someone with an extraordinarily close resemblance to John Redwood MP (Con). He was telling the British public that David Cameron (Con) had put him in charge of the Tories’ economic competitiveness review. I called a couple of people in to the room to view the TV for themselves and do you know what? 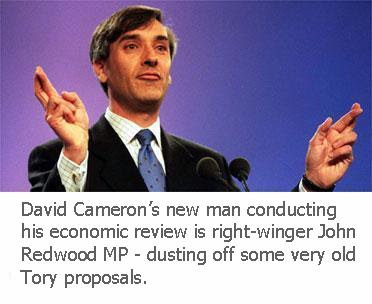 It was John Redwood! Why would David (I’m the heir to Blair) Cameron put the Country’s most famous, leading far-right Conservative politician in charge of anything if he is sincere that he wants to occupy the centre ground of UK politics? It doesn’t look like Mr. Redwood has changed his spots either; calling for health and safety laws to be relaxed, more privatisation of the railways, cutting planning laws to make it easier for developers, abandoning data protection laws and that old favourite... pulling out of European treaties. Those are just a few of his recommendations. When, just over a week ago I said that Mr. Cameron will "end his policy-free zone [by moving] the Conservative Party further to the right of British politics” I didn’t expect it to happen that week. I wonder what Mr. Cameron will do next? I’ve been contacted by a family from Richford Street, W6, who have been trying to renew their parking permit with H&F Council since June. Until last week, they hadn’t had any success. The Council is rightly keen to stop fraud and to do this requires proof of residency. However, my constituents question the Council’s competency at pursuing this having been given the run-around for most of the summer. Completed an authorisation form giving the Council’s parking staff clearance to check their council tax account some years ago but this year the Council told them that more proof of residence is required. Then sent a current phone bill with the address clearly showing but this was returned seeking further information. Then sent a copy their joint bank account to the Council (as requested) but this was returned with the Council insisting that it also needed to see their charges and interest payments. Eventually been sent their parking permit last week after sending in details of their bank charges and interest payments. I recognise that the parking department has never been perfect but this family told me that they think it has got worse this year and asked me to find out “Has the system been changed? Or is the system being operated incorrectly by the staff?” I have, of course, asked the relevant Director for a full explanation of what's happened. What I find perplexing is that two years ago, the last Labour Administration was finalising plans to streamline this, including allowing residents to renew their parking permits quickly online. I cannot understand why this hasn’t yet been successfully implemented. Please email me if you have experienced similar problems. If you have, you can also formally complain to the Council here and if you are not satisfied with the way the Council has dealt with your issue, you can then complain to the Local Government Ombudsman here. Omar Salem, a member of the London Young Labour Executive, has written this interesting and well researched piece about child poverty in the capital. He argues that specific policies need to be introduced for London as child poverty stands at 51% in inner London which is much higher than the rest of the UK. Click here to view. You can find out more about the campaign to End Child Poverty in the UK by clicking here and it is also well worth reading the Joseph Rowntree Foundation report; What will it take to end child poverty? Firing on all cylinders. In 1999, Prime Minister Tony Blair committed his government to ending child poverty by 2020. 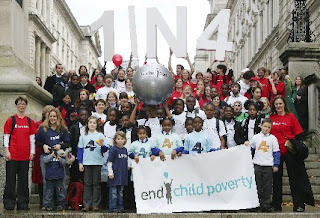 The UK has proportionally more poor children than most rich countries. In 2005, 3.4 million children were living in poverty. However, 700,000 children had been lifted out of poverty between 1998 and 2005. There is clearly much work still to be done. Prime Minister Gordon Brown has underlined his new Government’s fresh commitment to ending child poverty in the UK and Omar’s article gives an overview of some of the necessary measures that will help achieve that goal. 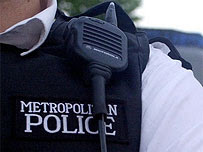 Rosemary Pettit of the Brackenbury Residents’ Association contacted me about a series of burglaries taking place in the Brackenbury area of Hammersmith. I had spoken to some of the victims after being contacted by them shortly after the incidents happened and there is an anxiety that the burglaries will reoccur. One person was actually burgled twice within a few days. I’ve also been in touch with the police and they’re confident that they’ll catch the culprits. Rosemary is keen to let people know that the H&F Crime Prevention Officer, Les Steggles, will come to your home and advise you how to beef up your security. Rosemary told me “Mr Steggles has a list of suppliers and recommendations - from alarms to window film and, in addition, [he] will point out some simple, cost-free measures to put burglars off”. Please contact Les if you’d like him to advise you on home security. Les is based at Hammersmith Police Station and can be contacted on 020 8246 2509, or email him by clicking here. Our thanks go to Rosemary Pettit. The political divide in Hammersmith and Fulham stretched all the way across the Atlantic in 2004. Labour sent support to the Democratic candidate; John Kerry and H&F Conservatives actively took sides with President George W. Bush’s Republican Party. One local Tory councillor is so devout a supporter of the Republican’s brand of conservatism that he had a National Rifle Association (the super-powerful pro-gun lobby) poster on his wall. Even today, many of our local Tory councillors have strong links with the Republican’s right-wing conservative base. People will rightly wonder what motivates both local political groups to take such an interest in American politics and I suppose there are many answers. One clear driver is that the USA sets the political climate for the World and we can all see how that has influenced life the UK. Dark clouds began to settle over the international political horizon when George W. Bush claimed the White House in 2000. By 2004, the presidential election demonstrated the grip that the American conservative movement had on that society. The Christian right, the gun lobby and anti-tax Republicans all came together to run a pro-war, anti gay-marriage, anti-abortion, pro gun-toting campaign that propelled Bush back to the White House on record turnouts. 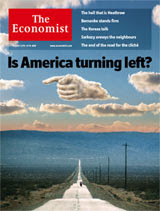 This week’s Economist has a piece suggesting that the American conservative hegemony is coming to an end. The Economist argues that they’ve “over-reached”. The incompetence surrounding Hurricane Katrina, the economy, Rumsfeld, Cheney and Iraq combined with the un-American activities of Guantánamo, the corruption around congressman Tom DeLay and the criminal sleaze associated with Scooter Libby has all caused the Bush Presidency to implode. The Economist suggest that this may have taken the Republican machine out for a generation. We’ll have to see. I do know that the issues Americans care about are leaning the Democrats' way. Polls show that 54% of US voters now believe that “the government should help the needy”. Democratic Presidential candidate Barack Obama has led the debate for health care for all and the American public seems to be responding positively. The Economist says 50% of Americans now align themselves with the Democrats. The New York Times reported that the figure is higher amongst the 17 to 29 age group. All this suggest that a Democrat will occupy the White House after the 2008 election. Many will agree that this offers a much brighter prospect for America and for the international political climate. In response to a quip at a recent Prime Minister’s questions; Gordon Brown told David Cameron “You stick to the PR and I’ll stick to being PM” summing up the difference between the two men in eleven words. Meanwhile, poor Mr. Cameron has so far spent the summer being sniped at by his own party. Friendly fire it is not. Tory after Tory has lined up to call on Mr. Cameron to end his policy-free zone and to move the Conservative Party further to the right of British politics. I predict that he will be forced to do precisely that as we’re already beginning to see (although his PR will argue the opposite). Those who have studied this closely will see that the Tory assault on the Cameron leadership dates back to last September. The Guardian then reported that the Tory MP for Hammersmith and Fulham launched an attack on Cameron’s tax pledge at last year’s Tory conference - proposing his own Estonian style alternative instead. The Sunday Times / YouGov poll shows that a staggering 51% of the British public now thinks that Mr. Cameron would do “badly if he became Prime Minister”. I couldn’t possibly comment but as Leader of the Opposition he has certainly already become a prisoner of the right-wing core of his party. 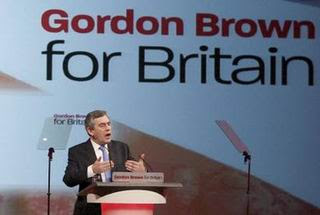 The same poll gives Prime Minister Gordon Brown the biggest lead Labour has had since 2003, with 65% of the British public saying he is “doing well”. It is just another poll but it demonstrates that (as predicted here) an increasing number of people will continue to recognise that Gordon Brown has the leadership, policies and vision that the country requires. The rule of law is one of the significant contributions that Britain has made to the World, ensuring that people from any background have the right to justice. 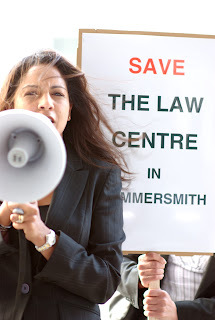 The Hammersmith & Fulham Law Centre has provided legal help to thousands of people - many the poorest in our community. They’ve taken on Rachman landlords, sweat-shop employers, bureaucratic intransigence, unscrupulous conmen and corporate bullies. And they’ve won. That legal protection is now under threat. Since the time of Dickens, lawyers like them have fought the legal battles that have made our community fairer and stronger for us all. H&F Council provided funding to the Law Centre for 28 years under previous Labour and Conservative administrations. But, the current Tory regime has controversially decided to cut essential financial support to the Law Centre by 60%. Dark days are ahead for those desperate for a legal safeguard. Yet when I have discussed this cut with the Tory councillors making the decision, I have been left thinking that they have no understanding of the consequences of their actions whatsoever. One naïve Tory frontbencher stood up in the Council Chamber to say that the cut to legal advice “didn’t matter” because they were still funding some other support services. Where did he think those support services were getting their legal advice from? The matter is now before the High Court. The decision to reduce funding was made by H&F Tory Council with less than two weeks' notice and with no opportunity for representations to be made. If you want to support the fight to keep the Law Centre, you can donate to their cause online by clicking here. The lawyers who work at the HF Law Centre could easily earn much more money elsewhere. They choose not to and intend to fight the cut to the end. You can also sign their petition by clicking here. The rule of law for all has been something the Law Centre has protected for a very long time. I believe that's important. It’s the British way. I’ve been invited to go down a sewer and it wasn’t by someone trying to be rude. I think I’ll go - although I really don’t like rats which I envisage I'll see plenty of down there. The offer was made by Thames Water’s maintenance team (see pic). I met them yesterday after they had completed works on the Hammersmith Grove trunk sewer, following problems after the recent floods (view previous posting). They told me that Non-Return Valves have now been re-fitted to all the properties that were recently flooded out in Hammersmith Grove and that they are working their way through the rest of the area. They were nice blokes who seemed to enjoy their work and were very professional. They suggested that anyone who is concerned about their home and wants their Non-Return Valve checked should call Thames Water on 0845 9200 800. You can view contact details and see how to complain about an unresolved problem by clicking here. The team also explained that Non-Return Valves need to be checked out every few years and that residents will need to contact Thames Water if they want that work to be completed. I have written to Thames Water’s chief executive raising questions about the problems with local sewers and asking what actions were being taken to avoid future flooding of people’s homes. I’ll let you know when I get a reply. Meanwhile, I hope they provide protective clothing for that trunk sewer trip. Residents of the Peabody Estate and I recently went to see Phil Rogers the manager at the Apollo on Hammersmith Broadway. It wasn’t a social visit. Queues to enter the Apollo snake down Fulham Palace Road on busy evenings and residents reported people urinating outside their homes, getting jostled when trying to cut through crowds to enter their estate and discarded fast food getting thrown into their gardens - which they say has attracted rats and other vermin. 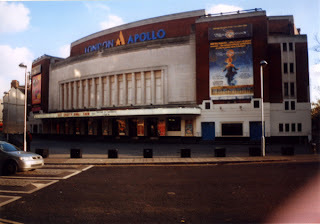 They also couldn’t understand why the Apollo was having its rubbish removed by a contractor at 3.00am causing sleep-stopping noise as the large steel containers were mechanically lifted onto the backs of refuse lorries. I have arranged for Council officials to contact Phil Rogers to ensure that he meets the terms set out in his licence agreement and I have been in busy email correspondence with him and his staff since our meeting. To be fair to him, he has agreed to take measures to address all of the problems saying “Please do understand that I am with yourself and the residents on this matter and agree that it [all of the issues] is totally unacceptable”. But it does give an idea of the types of issues residents living close to a large entertainment or office complex sometimes endure. We'll still all have to remain vigilant to ensure that none of the problems re-occur. Has Council Done Its Home Work on Hammersmith Grove Development? My fellow ward councillors and I have been contacted by large numbers of local residents who are anxious about the proposed Hammersmith Grove development. Concerns range from the oversized scale of the ten storey building to worries about heavy goods vehicles making dawn deliveries, extra parking problems, increased traffic chaos and late night noise from revellers leaving the three restaurants and cinema. I have written to Town Hall officials to uncover the extent to which they have undertaken studies on any of the problems that will occur if the current development plans are given the go-ahead. We now have official confirmation that the developer has been engaged in private meetings with H&F Council for much of the last year. It would therefore be natural to expect that all of the above concerns have at least been considered. If they have the Council isn’t saying what it has found out. We will continue to press them on the matter and let you know how we get on. 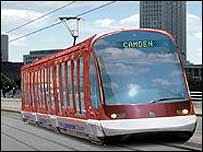 The Mayor of London has announced that the West London Tram will no longer go ahead and that Transport for London will instead look for more acceptable alternatives to improve public transport along the Uxbridge Road. Local MP, Andrew Slaughter (Lab) will be deservedly pleased having worked with community groups over several years to lobby Mayor Ken Livingstone about the issue.